The Precitec UABMH-150 attatchment is specially designed for heavy duty horizontal moving column boring machines which can take heavy attatchment. 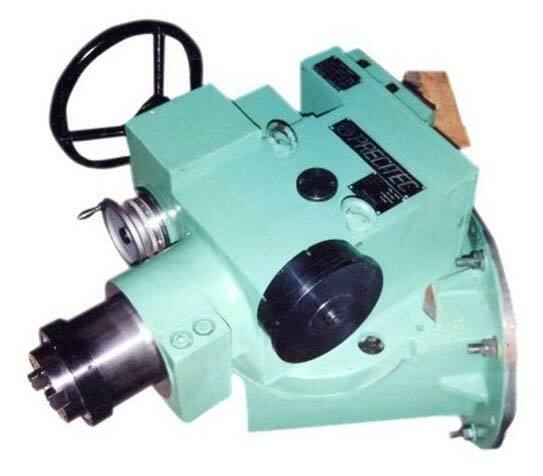 the unit facilities various activities like milling, boring, drilling etc ate any given angle. for this unit has a provision for alignment of the head in any direction (Universal). The best part of the unit is,it has an additional quill movement of up to 250 mm after titling to any angle. This facilities easy drilling, boring, tapping, reaming etc. in the required angle without having to tilt the job . This movement can either be manual or power fed for boring. Hence this unit becomes a must for all the floor boring machines greatly enhancing their machining capabilities.